In January 2003, Mike McDerment was running a small design firm when he finally snapped. He was using Microsoft Word to bill a client when he accidently saved over the invoice. It was at that point that Mike decided to build his own accounting software solution. To keep the lights on, he moved into his parents’ basement for 3.5 years to save money, and completely revamped how he ran his design firm to the point where he only worked 19 days in one year — while generating over $200,000 to bootstrap the company that would become FreshBooks. Mike’s ability to work so little and produce so much income had a lot to do with how he priced and positioned his services, something most small business owners struggle with. Tune in for tips and great resources that will put you on the path to charging what you’re really worth. And hey … Unemployable is brought to you by the all new FreshBooks, easy accounting software for freelancers, coaches, and consultants. You’ve simply got to try it for yourself with this special unrestricted 30-day free trial — just click here and then enter Unemployable in the “How Did You Hear About Us” section. Mike McDerment: I’m Mike McDerment, the cofounder and CEO of FreshBooks, and I’m certifiably unemployable. Brian Clark: In January 2003, Mike McDerment was running a small design firm when he finally snapped. He was using Microsoft Word to bill a client when he accidently saved over the invoice. It was at that point that Mike decided to build his own accounting software solution. 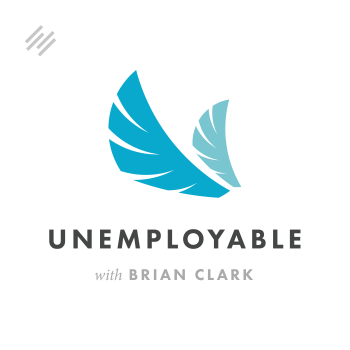 This is Brian Clark and welcome to Unemployable, the show that delivers valuable advice to freelancers, coaches, and clients, so that they can become more entrepreneurial and create the business and lifestyle they want. Thanks for tuning in. Unemployable is brought to you by the all new FreshBooks, easy accounting software for freelancers, coaches, and consultants. You’ve simply got to try it for yourself risk-free with this special, unrestricted 30-day free trial. Just head over to Freshbooks.com/unemployable, and then enter Unemployable in the “How Did You Hear About Us?” section to get your free trial. Mike, thanks so much for joining us today. Mike McDerment: Great being here, Brian. Thanks for having me. Brian Clark: All right, Everyone, Mike is the CEO of FreshBooks, and yes, FreshBooks is a sponsor of the show. This interview is completely separate from that, because as I’ve said many times in the spots we run, I have been aware of FreshBooks from the beginning. I admire the company. I’m glad they support the show, but I really wanted a chance to talk to the CEO and get some behind the scenes on the story. Plus he’s got some great tips on value-based billing, so you can get off that billable hour train. Brian Clark: Mike, how about just kind of give us some background on your journey up until FreshBooks. What were you doing that began your entrepreneurial journey? I built a simple tool to bill my clients, they really liked it. The whole thing was really just scratching my own itch. And that side project we started to realize, “Other people might like this.” So we decided to launch it. We did that with no success. Literally, nobody noticed. Two years after we got going, we had 10 people paying us $9.95 a month. So we were making about $100 a month and my cofounders are a doctorate in computer science, electrical engineering and I’m a business school guy. But we really loved what we were doing. I ended up hunkering down in my parents’ basement for three and a half years. We’re now about 300 people. It’s been quite a journey. Millions of people use our software every month. For those who aren’t familiar with it, it’s ridiculously easy to use, invoicing and accounting software in the cloud, so available mobile phone and computer. What I like to say is, “If you invoice, you need FreshBooks.” What makes us different is we only serve people who get paid for their time and expertise. We don’t do retail, we don’t do restaurants, we don’t do manufacturing — just time and expertise and we believe that makes it a better, easier to use product. What Is Your Free Ebook About? Brian Clark: Excellent. Interesting. I guess as part of your role with FreshBooks, you wrote a book that’s been really popular and it’s free. It’s called Breaking the Time Barrier. We’re going to link to that in the show notes, so everyone who hasn’t read it can go grab a copy. There’s a really interesting story that you tell about your own experience with billing clients and that was kind of the genesis of writing this book years later. Talk a little bit about that. Mike McDerment: Yeah, so the book Breaking the Time Barrier, by the way, super pleased to report it’s been downloaded over a quarter million times. It’s free. You can read it in under an hour and the purpose is to help people better price their services. My experience has been that folks who have the client service work, generally speaking, they undercharge. There are all kinds of models to figure out how much to charge, whether I do time and materials or hourly or all these things. What I found when I was running my own design shop was I got to a place where I was able to divorce the amount of time I worked from the amount I charged and still had very, very happy customers. The fundamental thing that enabled me to do that is I came to understand clients don’t want your hours, they don’t want your time, what they want are some kind of outcome, some kind of business result. I came to understand what those goals were and I was able to deliver those in a way that was very profitable for me, but very pleasing to them as well. What’s the First Step to Adjusting Mindset Regarding Pricing? Brian Clark: This is a topic that we return to quite a bit on the show. People, including me back when I took clients, they’re sensitive to price. We don’t feel that we can charge more even though we understand that the more we charge, the more money we make for the same amount of work or we could even work less. When you hit that kind of reluctance with people, what’s the first step you take with them to kind of get them in the right mindset? Mike McDerment: Yeah, I think the core area where I’d focus, and I guess there are a few things to address in there, but I’ll just go head on and answer your question. I think there are some other things to consider here. But the short answer, which won’t be exactly short…First of all, there’s existing customers and changing what you charge them, which is a different conversation. And there are net new customers. Let’s focus on net new customers, because they have a blank slate. They have a blank slate. What’s amazing to me, if you go and talk with actually your existing customers instead of a new one, a lot of them either behind closed doors or to your face will tell you, “I’d pay so much more for that.” If you’re doing your job right, you’re a great partner to them, they’d be happy to spend more money with you, and you can charge them more because you’re delivering so much value to them at a reasonable cost. I think lots of people don’t understand that and aren’t aware of that with their clients. But parking that and going to a net new client, because they have a blank slate and you haven’t set an expectation around what you charge yet, in that scenario, here’s what I would say. We generally by default undervalue our own services. So we’re already worried about price before the topic even comes up. But the way to get to the topic is to do some work before you talk about price. I was doing this just naturally for years without really realizing the impact. Before I brought on a new client, I would spend a lot of time trying to understand them and their needs. I did not offer a brochure with prices with “How Much Does This Cost?” I would just be like, “Hey, let’s take a meeting. Help me understand what you’re trying to accomplish.” What I would do there, and maybe this is just the entrepreneurial bug in me, but I’d be sniffing out for what are their problems and can I solve them? When I say, “Can I solve them?” I mean that honestly. I might not be able to solve them, but in the domain spaces that I was working, I generally could solve a few pieces of it. Once I understood those things, I would try and understand the materiality of the impact of their business. And that’s kind of where it gets more exciting. “Here are your problems, this is what they’re worth to you. I will charge you a fraction of that amount to deliver the results you need.” That is kind of a simplistic way of going about it. But if you understand their problems, what they’re really trying to buy — they’re trying to buy a solution, they’re trying to buy results. If you price that solution or result reasonably, relative to the impact you’re going to give them, you can charge an amount that is divorced from the number of hours that you work. How Do You Position Yourself as the One to Solve Their Problem? Brian Clark: Right. How would you advise people to position themselves to be the person who provides a solution or “I’m the right person to solve your problem”? I think that’s where people get hung up on, at a confidence level. Mike McDerment: Yeah, a couple thoughts there. I think if it’s your first client engagement and you’re relatively new in your field, this may not be the path for you quite yet. You’ve probably got massive imposter syndrome. You’re not even sure you can do the work, like you’re probably not equipped to ask some of the questions and get answers. I think that’s one end of the spectrum. But if you’re a professional and have been doing things for a while or you’re trying to say, “What direction should I take myself in?” What I would say is this — this approach works really well if you’re an expert in some domain and you actually have solved the problem for similar kinds of businesses before. An example of that might be… I built websites. We did a lot of work for the travel industry. So we started to develop expertise in the kinds of business problems people in the travel industry have. When somebody would come and speak with us, we were quickly ramping up and offering an understanding that wasn’t naive about their area of interest. I guess the short answer is going deep with a target customer segment so that you get those multiplicative benefits, and that helps you deliver more value for them faster, because you have more familiarity with the problem space, if that makes sense. I hope that’s all clear enough. I’m not sure that it is. How Did You Attract Potential Clients? Brian Clark: No, it’s clear. Totally clear. I’m curious, since you took clients back before the whole content marketing thing really got started, what was your primary way of attracting potential clients? Mike McDerment: Truth be told, the number one way it works for service-based businesses is referrals. So my clients would introduce us to people. Unfortunately, in most cases, in those scenarios, it was in non-consistent spaces, because they thought of us as their secret weapon. But yeah, it would be sort of word of mouth and referrals and “Oh, I know this person who does that kind of stuff.” And that was the primary way. The content marketing is a great thing to build your expertise and find people that way. I think it’s really important. That’s part of the solution for finding these people and positioning yourself as an expert. I did some teaching as well. So I think that would be another thing. That’s a good way to build your business and it’s a form of content, getting up in front of audiences and teaching. Brian Clark: Yeah, if you’re doing content marketing, you are teaching, so it’s very similar. I try to get people to understand that. Mike McDerment: I’ll steal this from a businessperson, a guy Jason Fried over at 37signals. The philosophy is there are two ways you can market. You can outspend or out-teach. I believe for services-based businesses, out-teach is really the genius way to go. What Is a Crucial Aspect to Position Yourself as a Value-Based Pricing Provider? Brian Clark: Absolutely. All right, so let’s say that we are positioned as a solution provider. We’re asking smart questions. Really what you’re trying to figure out is “How much is this solution worth to you?” and then coming in at a fraction of that, like you said. What else do you think is a crucial aspect of carrying out a plan to position yourself as a more value-based pricing provider? Mike McDerment: Yeah, a couple of things come to mind. I will continue to push people. If you’re interested in this topic, spend 45 minutes to an hour and read the book. It’s told like a fable and will help you understand some of the steps in the mindset. Having said that, I think of it like this, you want people, so what I would do is a bit of a process. First, I want to understand what your problems are. I want to play back to you at some point in that conversation, “Are these your problems and do you understand them? Do I understand them effectively?” Because that’s important. What I would then do is go away to my office or wherever I was working, my lair, as I like to say. I would go and I would put together a menu for them of things that will solve those problems. I would come back with a proposal that says, “Listen, if these are your problems, here are the things that I would purport to do to solve your challenges. I believe the end result will be this.” I’m kind of signing up and saying, “Here’s the impact I believe we will have if we do this.” And what you want people to do is opt into that. By the way, I think this is important to articulate. If we don’t do those things, this is probably to what degree the ultimate “solution” (and by the way, I hate that word, but let’s use it for now) it’s going to deliver to you. I never try to get positioned as a solution provider. I wanted my clients to know that I understood their problems and I was the best person to help them solve them. Ultimately, we’d be forging a partnership. And then I’m bringing them a menu of things, they’re saying, “Yeah, I want everything. I can’t afford everything, so I’ll take those off.” And I’d say, “Great, you’re hair cutting your results. This is the result,” and they’d say, “Okay, I get it. Okay, let’s get going,” and we’d work on it. Then I’m not charging by the hour. I’m just responsible for delivering these projects, because collectively they get them where they want to go. Brian Clark: You’re big on the concept of business courage and it seems to me that that’s relevant here. We can tell people all day long to say no to the wrong client so that you can stick with the good clients, and yet it takes a certain amount of courage to do that, especially when you’ve got bills to pay. Here’s how I think of momentum and progress. When you get started, you’re standing still and any step you take, your first step, you’re heading in a direction. You’re not going that fast yet, but you’re heading in a direction. The faster you can start running in one direction a) the faster you’re going and b) the harder it is for you to change direction. When you take a client that doesn’t fit that end goal, you end up running not in as straight a path as you could before. So inherently, you’re going to take a longer road, you’re getting distracted, you might get lost. None of that is what you want. I think the discipline to say no… What I like to say to other folks who are building businesses is you have to say no 27 times to various opportunities, or what have you, so you can say yes once and have it be the big outcome that you want. Does that make sense? It’s like you just have to say no so many times so you don’t get burdened with distraction and responsibilities and small things, and so you’re available when that one really good thing comes and crosses you. Were There Clients You Should Have Told No But You Didn’t? Brian Clark: Yeah, sometimes you’ll come across a client that seems like a good thing. Yet, I know for me, there were always red flags and if I ignored them, I regretted it later. Do you have any good stories or red flags of clients that you should have said no to, but you didn’t? Mike McDerment: Great question. I don’t want to cop out on this one. First of all, I will say I’m going back over a decade. Brian Clark: I did put your memory on the spot here. Mike McDerment: My journey was you start off and you take anything you can to rub two nickels together. I was making – no, I had no income. I had to go out and find the first client. I think by and large I was pretty lucky. Sometimes you would get people. I think of one guy. I met him through my brother-in-law of all people and they had met sort of socially. And he had a website, he had big visions. He was a sales guy, big visions. He was selling basically car stuff online, ecommerce. He had big, big visions for what he wanted to do. And that part was exciting to me. But when I sat down with him and understood what he was trying to accomplish and what he expected in terms of the dollars for that, I was like, “Listen, that’s not how I work. First of all, you don’t determine the price. And second of all, we’re way out of line with one another here.” And I just said, “Thank you very much, good luck.” But I also came away from that feeling like he wasn’t the kind of person I wanted to be in business with. Now, did I need the money? Yes. Would that have been a hugely unprofitable undertaking for me? Absolutely. It would have never been profitable for my time. And to be honest, I feel like I would have taken psychological hardship working with this guy, because he just didn’t seem to be a values fit for me. To me, I want to be somebody’s partner. I don’t want to work for them, if that makes sense. Brian Clark: Yeah, it totally makes sense. All right everyone, again, the book is called Breaking the Time Barrier. I bet if google that, it’ll pull up. But it’s also going to be in the show notes. How Did You Shift from Taking Clients to Making Products? Talk a little bit about how you made that shift. I know the epiphany when you overwrote your invoice, which had to be painful. But there’s a difference between an idea and the execution obviously. Mike McDerment: Yeah. I think we just fell in love with trying to bring this thing into the world. So that was the core thing that kept us going in the absence of any kind of financial success for a long time. Honestly, that is kind of the core of how the story started out. What’s interesting about it, it wasn’t enormous, but I think quite a successful services business — very happy clients and growing year on year and all that good stuff and no end in sight for that thing. But the bug caught me on this other effort. Part of what I loved about it was I didn’t know anything about building a product company. I’d never worked at one. It went so far as like, I didn’t even know that it was really that different, but it’s a completely different thing. There are just a lot of dimensions to it. I describe it like this: it’s like you’re playing three dimensional chess, because you’ve got building the product, you’ve got marketing the product, you’ve got running the business and the team. All of those things are really deep areas of learning and expertise. It’s not that it’s not like that in services, but it’s somehow different. Because the actual ability to sell services and make the rent I think is actually a little easier than to create a product, get it to market and make enough money to feed yourself. Brian Clark: No, without a doubt. And you’ve got to get everything right. I think that’s why people are so trepidatious about it, but it is doable. How Did You Manage Building the SaaS platform? So you were basically building websites for people and then you go to build a SaaS platform. Do you have a coding background or how did you manage that project? I had very little programming knowledge, but I had a little and I just started working with databases and building websites that ran off databases. I wasn’t very good at it, but I knew what problem I was trying to solve and I would sort of dogged in my ability to build a prototype that represented that. To be honest, the initial thing took a couple of weeks. It was completely terrible, but it got the idea across. The expression of it was clear and my clients could actually use it, even if there were lots of workarounds and all these other things. With the technologies available today, you could probably all do it much faster, easier and have it look better. The short answer is I took some electives in computer science while I was in business school. I had taken a little programming education, but I honestly wasn’t that good at it. But I had the desire to solve a problem and I used that limited amount of knowledge to get a prototype together. And then other people ran with the building of the product after that. How Did You Handle FreshBooks’ Growth? Brian Clark: Yeah, I was curious because with me, outside of HTML there’s nothing. So I definitely had to rely on others for us to build once we got into software. Fortunately, I had a great partner and now COO, and that’s another lesson — building the right team. Did you find that aspects of FreshBooks’ growth, which has been amazing, a challenge or did you just really love that aspect of it? Mike McDerment: Just to clarify for myself, was the challenge around growth or around building the team? Brian Clark: Well, to me, I see growth necessitates the addition of people that fit your culture. That always keeps me up at night when we add people to make sure that we’re keeping what the company stands for. And we’re lucky, because our philosophy is out there in the world, thanks to our content. If I had to hire traditionally, I think it would be much more difficult. So I see them hand in hand, but tackle it how you see that. Mike McDerment: Yeah. Many years into my FreshBooks journey, I stumbled across this quote, which is, “Every problem is a people solution. Every solution is a people solution” The fact is the business that I run today, it’s humans. You might say we’re a technology company and I would say that’s the category we’re in, but if you get down to it, it’s all people and people about it. And that’s true in almost every business. Another little sort of throwaway quote that I stumbled on in the last few weeks I think is great. It’s like, “The company is the team.” Basically the quality of your team is the quality of your company. When you really start thinking about it like that, it’s so true. That’s where I’m at today. I will say when we started out, I was listening to the Stanford Entrepreneurial Thought Leadership Podcast series. In my spare time for inspiration, I was listening to this podcast series. And through that, the importance of culture was imbued into me, in hindsight now, in a very, very deep way. It really spoke to me. Just this notion that culture is strategy and culture ultimately makes all the difference. If you ask me today how I would define culture, because I don’t know how I would’ve done back then, today I’d say, “Culture is what happens when no one’s looking.” Do people walk past a piece of garbage or do they stop and pick it up? If there’s a deadline coming up and it’s going to take an extra 30 minutes and it’s going to cut into some quiet time, but it really should get done, do they do that or do they show up the next day and say it’s late? That to me is what culture is. We started on a journey of saying, “Okay, if this is important, how do you solve for it?” I had the good fortune to bump into some mentors. One in particular is one of the founders of Rackspace and they were really big into values and had a service culture like ours. Rackspace and Zappos are known for customer service. And actually FreshBooks is too. We get to beat them sometimes for awards when we go out and compete on those things in the industry. But the point is I built not a marketing system or a software development process. A system for building a great culture and keeping it alive is something I started to formulate and learn about in my head. And it ultimately starts with hiring the right people. Then as you get enough people, you have a defacto set of values that you may not have written down yet. But eventually we said, “We’re like 20, 30 people. We’ve got to write this stuff down.” And those have been our values ever since. That’s I guess kind of how I think about it and some of the journey. You want to have the right people and you have to be, dare I say, militant about enforcing and keeping your values. And that doesn’t mean everybody is the same. That’s not what I’m going for. I want different political views. We have a very diverse culture from a gender and ethnicity standpoint. Beliefs can be very different. But when you cut under that, to me, the values are something kind of under the skin in people. It’s when push comes to shove, how do they naturally behave and what behaviors do you see every day as a result of that? And that’s the place where you don’t want to compromise. We got good at interviewing and listening for what are those things or signals that people will tell us when they walk and talk or show to us that demonstrate they share our values and therefore, would be a good thing. Again, not looking for homogeny. We want each person to bring something additive to the culture of the company, but we want them to share this value set underneath that. Brian Clark: That’s great advice. Mike, thanks so much for joining us today. Mike McDerment: Thanks, Brian, good being here. Brian Clark: All right, Everyone, this is the last episode of Unemployable for 2017. We’ve been talking a lot about finding your ideal clients, charging what you’re worth, value billing instead of hourly billing. Go download Mike’s book. Finish it up and this is a great way to start off 2018, getting paid what you’re worth. Thanks for listening, Everyone, and keep going.